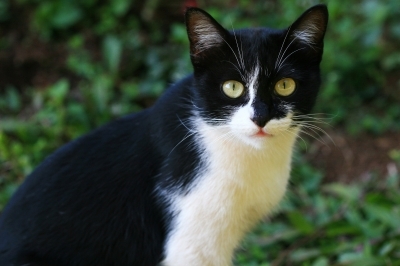 Cats that go outdoors face a number of hazards including cars, predators, contagious diseases, and pet thieves. However, many people don’t like the idea of keeping cats indoors and prefer to find a compromise between safety and freedom. Some cats take to leash training, but others aren’t so amenable. However, there are several other options for keeping cats safe outside: cat fences, window enclosures, and freestanding enclosures. Cat fences can be purchased either as extensions or freestanding fences. Extension fences are attached near the top of an existing wood, chain link, or stone fence. These prevent cats from going over the top of the fence, thus protecting them from land predators, cars, and poisons outside the yard. Extensions only work if there is a good, solid fence in place that is free of holes or spaces underneath where cats can squeeze through. Freestanding cat fences have stakes that secure them to the ground so that cats can’t slip underneath. When a fence is first erected, cats should be watched to make sure that it is effective. They should only be left unsupervised once the owner is sure that the fence does not have any vulnerabilities that the cat can exploit to get out of the yard. While cat fences offer protection from most predators, they won’t keep owls, eagles, or hawks out, and these birds sometimes prey on cats, particularly small cats and kittens. Also, cats that are allowed to go outdoors, even if only in a fenced area, should also have all the their required vaccinations, including rabies shots, and should be checked for ticks after being outside. Outdoor cats are more likely to get fleas as well. These are small enclosures, approximately the size of a windowsill air conditioner. They may be made from Plexiglas or coated wire. A window enclosure is really more of an outdoor observation space for cats. It doesn’t provide the opportunity to wander around as does a cat fence or a large outdoor enclosure, but if there is no yard space and a busy road nearby, it’s a far safer way for a cat to get fresh air and sunshine than going outdoors. Freestanding outdoor enclosures may be all metal or have wooden frames with thin metal fencing wire. They can be as large as an owner is willing to build or purchase, and can be equipped with logs, nontoxic plants, and anything else a cat might enjoy. There are also freestanding cloth mesh enclosures, but cats should not be left unattended in these as they will be vulnerable to predators and unable to escape. Screening in a porch is another way to create a cat enclosure. Cat enclosures can be small and simple or large and elaborate. They might comprise anything from a basic cube-shaped wire cage to a fantastic habitat with wire walkways, trees, water fountains, and rockeries. To see pictures of a broad array of cat fences and enclosures, visit Cats of Australia’s Outdoor Cat Enclosures and Cat Runs pages. Reference: Rainbolt, D. (2008). Cat Wrangling Made Easy: Maintaining Peace & Sanity in Your Multicat Home. Guilford, Connecticut: The Lyons Press. It’s interesting how you said that cat fencing supplies can be directly added to an already standing fence. We recently bought a kitten that has been so much fun for our kids to have and raise. I’m a little worried that she might be a bit of a handful later on in life, so I think investing in a cat fence now might be a good idea.